Poll: Who do you think will claim Division 1B hurling league promotion? The second tier action begins next Saturday night. Limerick's Gavin O'Mahony and John Conlon will be central to their side's hopes of glory. THE PRIZE OF promotion will be the key aim for sides in Division 1B of the Allianz hurling league that starts this weekend. The top four in the division will now advance to this year’s quarter-finals but it’s only the top side that will claim promotion to Division 1A next year. But who’s going to follow in the footsteps of Waterford, who finished top of the second tier last year? Clare are the favourites followed by Limerick and Wexford while Offaly, Laois and Kerry are ranked as outsiders by the bookmakers. Let us know who your tip is. Email “Poll: Who do you think will claim Division 1B hurling league promotion?”. 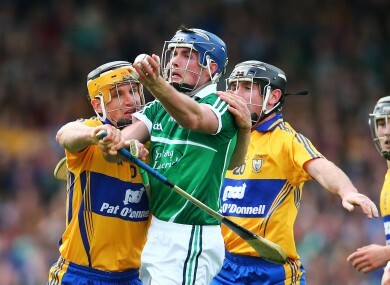 Feedback on “Poll: Who do you think will claim Division 1B hurling league promotion?”.